This little blog post is gonna be as short and sweet as I can make it - I've had a very full, very fun day, first stamping with my ladies in WOW! Christmas Cards class, then at the ice rink with Emma, then visiting with my pal Kimberly. That's a lot of day for this ol' girl and I need to take myself off to beddy bye so I can do it all over again tomorrow! LOL! Here is the sketch this week from Stamping 411. It was perfect for me this week as I was designing for my classes today and tomorrow and this layout fit my design idea perfectly - love it when that happens! I love, love, love this sweet little Christmas girl. She is from the oh, so popular Greeting Card Kids stamp set - that I'd sworn not to order because I'm not a big watercolorer - but I saw SO many of my friends using it, I just had to jump in the pool too! 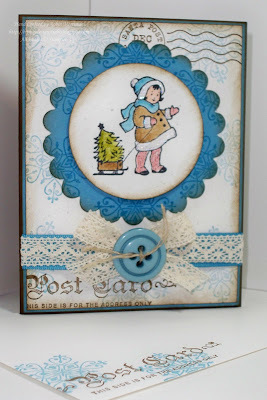 This is really short on details, but just so you know, I used the Winter Post stamp set (may it never retire!) along with my sweet little girl. The colors are Soft Suede, Marina Mist and Naturals Ivory. The watercoloring was done with my Aqua Painters and Re-inkers and I colored her fur trim with the White Gel Pen then added some Dazzling Diamonds Glitter. The ribbon is the Victoria Crochet Trim paired with some Marina Mist 5/8" Grosgrain. I used one of the Candy Cane Big Designer Buttons and some Linen Thread with it. And of course, I had to stamp the inside too. 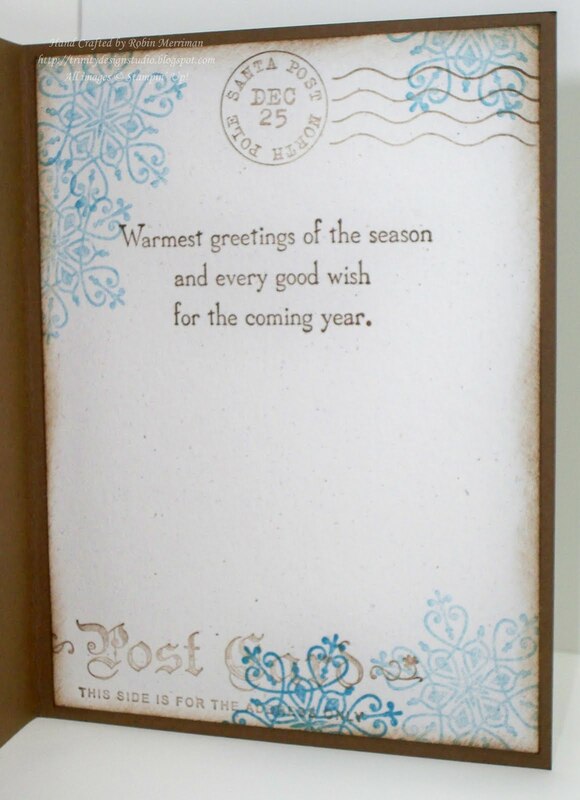 The greeting is from Many Merry Messages. 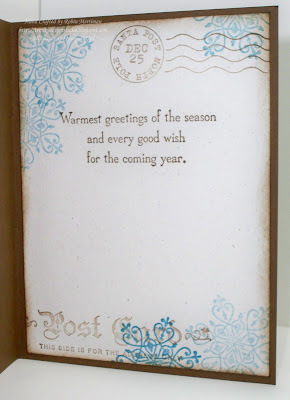 Be sure to check out the Stamping 411 blog and see what the other Operators designed for you this week. I know they will be awesome projects! Have a wonderful Fall weekend everyone! This is too adorable. I just got this set today...I can't wait to re-create this adorable card. I love everything about this from the colors to the lace! Just adorable! Oh my WORD! That is stinkin' adorable. All the details...stunning! Love that I was able to spend time with you. Robin, this is so incredible. I love the colors you've chosen. Do you know I just picked up Winter Post? It's not mounted yet, but I now own it!!! 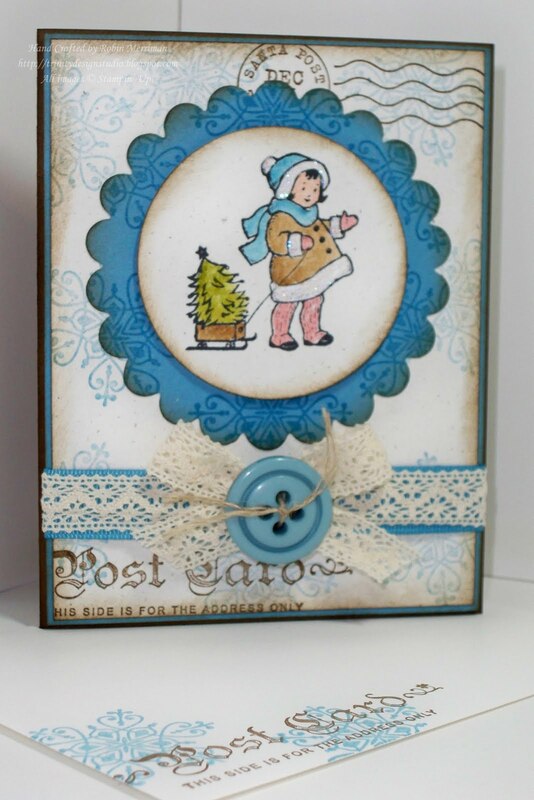 Well I don't know where to begin on this card Robin, there are so many fabulous elements...the coloring on that little cutie is awesome, love the stamped background, the lace, and on and on....great job as always!! What a sweet card Robin! 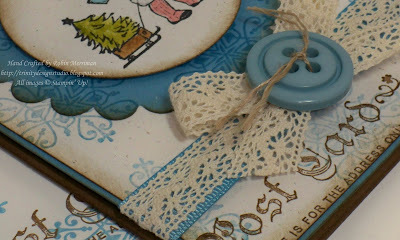 Love the watercolor, the distressing and the vintage feel of the color combination! Great job and what an inspiration! I absolutely LOVE your card Robin. Everything about it is so beautiful! You have made me want it even more with your beautiful work. the gorgeous artwork on this card speaks for itself! I really love this card! you knocked it out of the park. 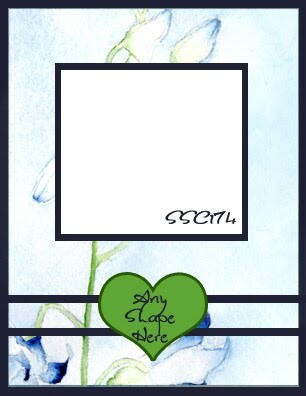 So sweet...love your card done in blues! This it adorable Robin!!!! 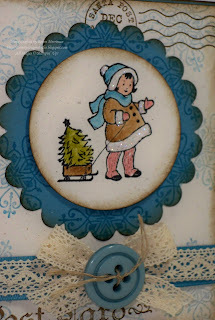 Love love these colors and that image is too stinkin' cute!! !